Grow back RECEDING GUMS with these home remedies.. 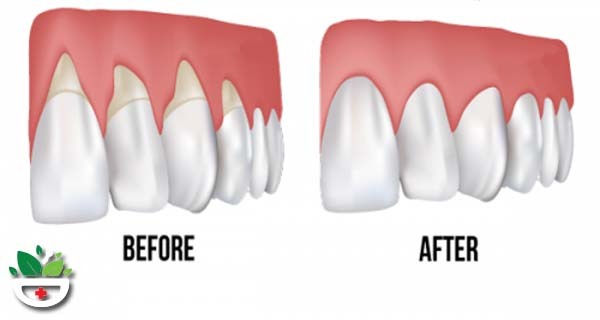 Receding gums, as the name itself suggests, occurs when the gum tissue around your teeth wear away and the gums seem to recede backwards making a larger area of the surface of tooth more visible. This makes it easy for bacteria to build up and survive there. If you do not contain receding gums, even the root of teeth may become exposed which can then cause pain making your teeth extremely sensitive. Not only this, due to the damage caused to the supporting tissue and bone structures of your teeth, you may eventually lose teeth. Gum diseases, specifically speaking periodontal diseases meaning bacterial infections that occur in your gums. These infections damage the gum tissue and your teeth’s supporting bone leading to gum recession and then other problems. Poor oral hygiene. If you do not brush or floss properly, you may end up building plaque on your teeth. This plaque then turns into calculus, also called tartar. Tartar is the hard substance between your teeth and may cause gum recession. Brushing teeth aggressively. Yes, this is contrary to the previous cause which says if you don’t brush properly, you may get receding gums. In fact, if you brush your teeth aggressively, then also you may get receding gums. This is because such an aggressive act wears away the enamel present on your teeth. This in turn makes the gums recede. Hormonal changes, especially in women, may also sometimes cause receding gums. The changes in hormones make the gums more sensitive and vulnerable. Smoking not only causes various diseases including cancer and lung diseases but also receding gums. Those who consume tobacco in any form are prone to have sticky plaque on their teeth. This leads to gum recession. Piercing of your lips or tongue can also cause gum recession. This is because the jewelry that you wear after piercing may get rubbed against the gums. This may lead the gum tissue to wear away. The health benefits of green tea are many. You can add treatment of receding gums to this too. As it is well known, green tea has loads of antioxidants that keep away many diseases by combating free radicals. Free radicals in your mouth can cause periodontal disease that may lead to receding gums. Green tea has catechins, an antioxidant that helps combat even the existing periodontal disease. These catechins in your green tea will strengthen the bond between your gums and teeth. The anti-inflammatory properties of green tea will reduce the swelling of gums that obstruct the proper healing of your gums and oral diseases. Make a cup of refreshing green tea for yourself in the morning. Have one cup of such green tea daily in the morning. Another natural anti-inflammatory agent is the herb Aloe Vera. Aloe Vera is popular as a beneficial herbal remedy for most of the skin problems. This is due to its anti-inflammatory as well as cell repairing capabilities. When it comes to receding gums, Aloe Vera not only reduces the inflammation of gums but also activates the cells that are important for repair of tissues. Aloe Vera also has anti-bacterial properties that help keep the infections away from your mouth. There are two ways to use Aloe Vera gel for receding gums- for brushing and as a mouthwash. Every morning and at night, when you have brushed and flossed, take some Aloe Vera gel on your toothbrush and brush your teeth and gums once again. Wash mouth properly after finishing off after 3-5 minutes. Alternatively, use Aloe Vera gel as a mouthwash. After you brush in the morning, add some water to the Aloe Vera gel and mix well to get a consistency that’s easy to swirl around in your mouth. Wash your mouth with this Aloe Vera mouthwash. Do this every time you brush during the day.